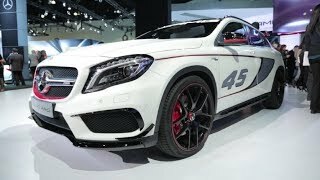 Mercedes has unveiled the GLA 45 AMG Concept, with distinctive design and powerful engine, at the 2013 Los Angeles Auto Show. 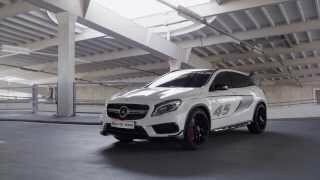 On the exterior it gets a large front splitter, large cooling air intakes, air deflectors with additional flics, AMG high-performance braking system with red brake calipers, distinctive AMG logo on windscreen, twin-blade radiator grille in silver chrome, high-gloss black inserts and roof rails, large rear aerofoil and AMG forged wheels in a cross-spoke design. 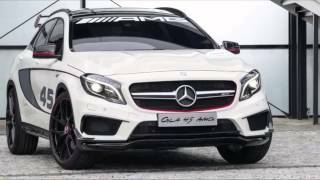 The 2013 Mercedes Benz GLA45 AMG Concept is powered by the AMG 2.0-litre turbocharged engine with an output of 360 hp and a maximum torque of 450 Nm. 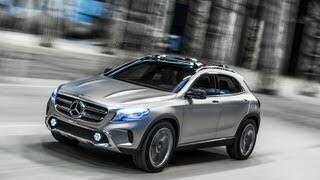 It is the most muscular four-cylinder engine in series production anywhere in the world. Acceleration from 0-62 mph comes in under five seconds.